These larger spindle gouges are great for roughing and long curves. They have a shallow flute. All these tools are made of forged M2 high speed steel to hold an edge a long time. They are not for faceplate work. Tool length is approx. 7" with a 10" handle. 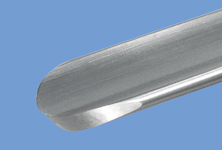 The 1-1/4" size is fitted with a 14" handle.